I've been a big slacker when it comes to blogging lately and I'm sorry about that. I have been so busy I can't think straight! I'm afraid it's only going to get worse as I ramp up for conference season at work. Starting next week I'll be attending three conferences in just three short weeks. The fun part is I will get to travel to places I've never been before. First I'm off to Charleston, SC, then Syracuse, NY, then my last stop will be Mackinaw Island. I hope I can blog about the yummy foods I will be eating while traveling! Anyway, let's get back to business. 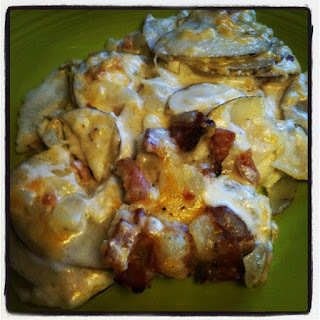 Earlier this week I used my leftover Easter ham to make PW's recipe for Scalloped Potatoes and Ham. It was DIVINE! I am so not kidding. Creamy and cheesy and just oh so yummy. You should try it today. Or this weekend. Or as soon as possible. You won't regret it!! I've included the recipe below, or you can read PW's original post here. Preheat oven to 350 degrees and butter a large casserole dish. Heat butter in a large skillet. Add onions and cook for 1 to 2 minutes, or until they start to turn translucent. Add ham and cook for 3 to 4 minutes until thoroughly heated. Remove from heat and set aside. Combine half-and-half and cream in a microwave-safe container and nuke for a minute or so, until no longer cold. Whisk in flour and black pepper until totally combined. Set aside. Combine the two grated cheeses. Set aside. Using a mandoline or slicer, slice potatoes into 1/8-inch slices (very thin.) Layer 1/3 of the potato slices in the buttered casserole dish. Sprinkle on 1/3 of the ham/onion mixture, then 1/3 of the cheese, then pour on 1/3 of the cream mixture. Repeat this twice more, ending with a sprinkling of cheese and the rest of the cream mixture. Cover dish with foil and bake for 40 minutes. Remove the foil and bake for an additional 20 minutes at least, or until bubbly and hot. I love this dish. All creamy and cheesey and then the taste of ham. Perfect.